My poster for Professor Lieu’s public talk. Classics Talks is delighted to announce a preview of the content of a soon-to-be-published book. 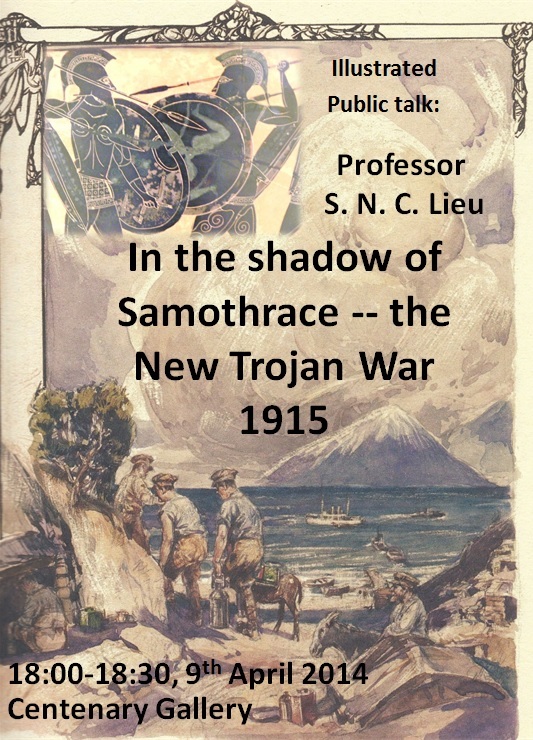 Professor Samuel N. C. Lieu (Inaugural Distinguished Professor of Ancient History, Macquarie University, Sydney, Fellow of the Australian Academy (Humanities), currently Visiting Fellow at Wolfson College, Cambridge) has kindly agreed to record his public lecture, which is one of the public events centred around the international conference Classics and Classicists in WWI. His illustrated talk on Australians’ use of classics to understand events and experiences in WWI will be available on this site, but anyone who is able to attend in person is most welcome. The battle landscapes of Gallipoli and the Dardanelles campaign in WWI overlay those of ancient Troy, as memorialised in Homer’s Iliad. Prof. Lieu will show how soldiers reflected on those mythological resonances and how classical themes were absorbed into the memorials of ANZAC (Gallipoli) Day as a new Australian myth of foundation and identity. The Centenary Gallery is on the Parkinson Court level of the Parkinson Building, University of Leeds. Wheelchair access is currently through Chemistry due to building work. My publicity for the performed extracts from Trojan Women (twenty minutes in total comprising a number of encounters between actors and audience within the exhibition space. 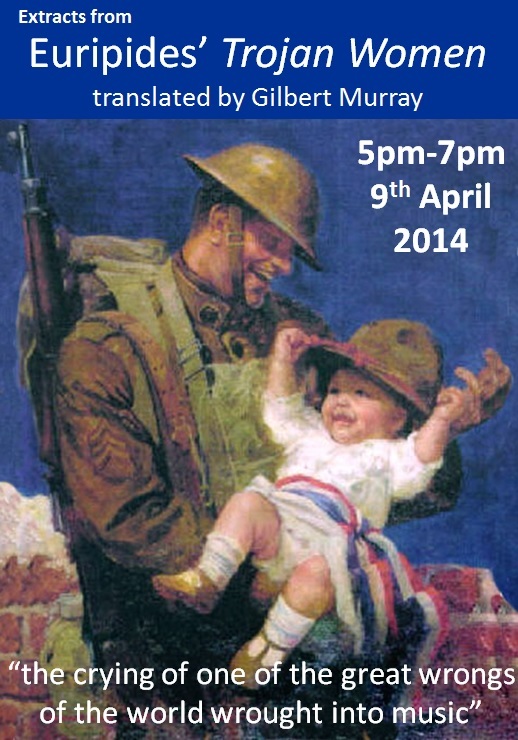 Image of a soldier with an infant wearing his hat from the November 1918 issue of Ladies Home Journal. Other public events include performance of extracts from Gilbert Murray’s 1905 English-rhyming-verse translation of Euripides’ Trojan Women – the world’s greatest antiwar play (according to Eleanor OKell, 2012) or “the world’s greatest peace play” (according to the Women’s Peace Party, 1915) – 17:00-19:00 9th April 2014 and a number of exhibitions. Exhibitions in Parkinson Court focus on experiences of WWI in the north of England, including the Scarborough, Hartlepool, West Hartlepool and Whitby bombardment of 16th December 1915. An exhibition in Special Collections presents “Songs of Troy” exploring links between the 2nd Trojan War (as narrated by Homer in the Iliad) and WWI made by soldier-poets, Americans responding to Murray’s translation, Margaret Storm Jameson and Simon Armitage. A further exhibition on clasicists’ contribution to the war effort is open only to conference delegates but the materials will be made available through talks and online in the near/mid-term future.